What Are Mint Coin Sets? What is a mint set? Is it anything like a proof set? While the latter will to be answered in a different article, the answer to the former can be found right here. What Is A Mint Coin Set? Mint sets are, literally, sets of coins packaged by the U.S. Mint. These coins, always uncirculated and sometimes of better strike and finish qualities than regular business-strike coins (those produced for circulation purposes), are then assembled into (usually) cellophane packages which are sold in sets that typically include all circulating coins from all U.S. mints producing circulating coinage. However, there are exceptions to some of these rules, which will be discussed in a moment. The United States began producing mint sets in 1947. With some breaks in production during the years (including the prominent absence of mint sets during 1982-1983), U.S. mint sets have undergone largely 3 changes in set format. Early mint coin sets (those produced before 1959) were housed in cardboard containers and included 2 examples of every denomination and mint. Beginning in 1959, the U.S. Mint switched its packaging format to cellophane packages, each striped with 2 brightly colored tape inserts on the top and bottom edges of these packages. Blue indicates coins struck at the Philadelphia mint, and red indicates coins struck at the Denver and San Francisco mints (in years when San Francisco struck circulating coinage). Since 1999, the U.S. Mint has included white and black strips to denote, respectively, Philadelphia and Denver packages containing 50 state quarters. In 1965, the U.S. Mint began striking “Special Mint Sets.” These mint sets, produced for 3 years (1965-1967) are housed in hard plastic containers and boast coins with mirror-like finishes (“prooflike”). Why did the U.S. Mint use this “special” format during the mid-1960s? In brief, this occurred at a time when the nation was facing a coin shortage in the wake of the rising prices of silver and the increasing activity of people hoarding silver coinage that was still circulating at the time. In 1965, the U.S. Mint reduced the silver in the half dollar and completely eliminated silver from the dime and quarter. Furthermore, the U.S. Mint removed mintmarks from coins during these 3 years allegedly to mitigate collecting and hoarding activity. 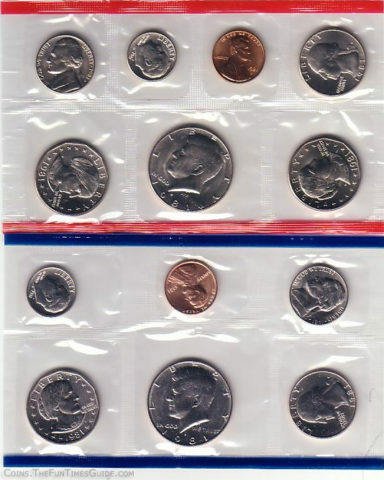 In 1968, the U.S. Mint returned to packaging mint sets in cellophane containers, and also resumed using mintmarks. This resulted in sets containing at least 10 coins (as was the case prior to the Special Mint Sets of 1965-1967). Also, the U.S. Mint returned to using those brightly colored tape insets to distinguish the Philadelphia coin set from the Denver and San Francisco issues. and again, for a short period of time, the San Francisco mint produced business strikes when it churned out millions of Susan B. Anthony dollars from 1979 through 1981. This point brings one to realize that, in fact, mint sets sometimes offered more to the collector than circulation coins ever could over the years. 1970 mint sets contain the 1970-D half dollar, a coin with a mintage of only 2,150,000. This coin was originally issued for inclusion only in mint sets (though many 1970-D half dollars have since been cut out of its packaging and have even entered circulation). 1973 mint sets contain the copper-nickel clad Eisenhower dollar, of which the Philadelphia and Denver strikes were sold only in mint sets. 1981 mint sets contain the Susan B. Anthony dollars which, during the last of a very short 3-year production period (not including the 1999 strikes hastily produced to fill a circulation void nearly a generation later), were found virtually only in mint sets, with none being released for circulation that year. Many have long ago since been removed from mint sets, and some of these have found their way into circulation. 1987 mint sets contain the 1987-P and 1987-D Kennedy half dollars, 2 coins found only in mint sets and “souvenir sets” (coin sets sold at the U.S. Mint gift shops to those wanting examples of coins produced at the respective facilities). 1996 mint sets contain the 1996-W (West Point, New York) Roosevelt dime — a coin which was not issued for circulation purposes. 1971 and 1972 mint sets do not contain those years’ Eisenhower dollars. 1999 mint sets lack examples of the Susan B. Anthony dollars struck that year. Current mint coin sets can be obtained by ordering them from the U.S. Mint. Mint sets of previous years can easily be found and purchased through coin dealers. Mint sets, especially those produced since 1965, are very inexpensive (most are under $15 apiece, and nearly all are under $25, presently). Those sold in cellophane containers before 1965 are often a little harder to find, but can still be had for between $30-60 in most cases. Mint sets produced between 1947 and 1958 inclusive are very difficult to find, often contain toned coins (due to the cardboard housing) and, because they contain 2 examples of each coin, are particularly expensive. Generally, these mint sets can cost hundreds of dollars each to obtain.